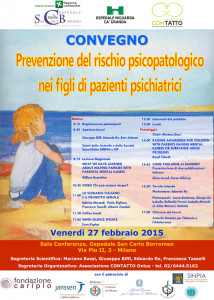 This groundbreaking conference, the first of its kind in Italy, will be an opportunity to open a dialogue in Italy amongst different disciplines involved in mental health care, from childhood to adulthood. It is aimed at professionals and mental health service providers, general medical practitioners, pediatric social services for children and families, and educational institutions. In addition to its educational impact, the conference is expected to create a greater sensitivity on the subject of this risk, an improvement in the ability of health care workers and educators to communicate about the issue, and to overcome stigma. More sensitive and more specific knowledge will activate a multi-center approach, acceptable and effective support, and improvement in building the resilience of Italian children and families. Mr. Kaplan’s presentation, entitled When Silence Speaks, will offer thought-provoking insight on the dual experience of having been a child of a parent with a mental illness who is now a parent with a mental illness raising his own child. He will talk about the peer-led interventions that Child and Family Connections, Inc. is conducting in the United States. Expect a combination of personal narrative, artistic expression, and practical experience presented in a deftly creative, compassionate, and moving way. A copy of the conference flyer can be viewed and downloaded here.